Founded in 1972 by Lino Dainese, true to its mission of advocating and delivering safety in dynamic sports, the Company designs advanced protective head-to-toe gear for motorcycling, winter sports, cycling, horse riding and sailing. In 2007 Dainese acquired the iconic premium sport helmet manufacturer AGV, established in 1947. The new Dainese Settantadue brand, established in 2017, reinterprets the design of historic garments that are a part of the stylistic heritage of the Group, with a contemporary twist. 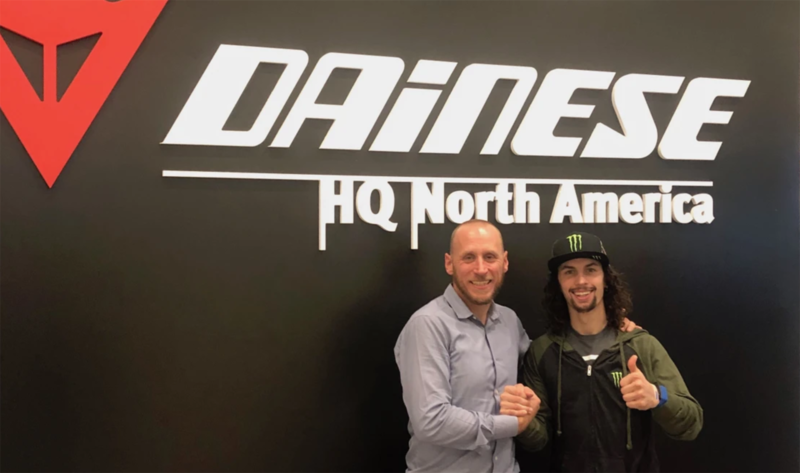 Dainese and AGV products represent the technology frontier in the field of protection for dynamic sports and are used by the world’s top athletes including Valentino Rossi and Sofia Goggia, Olympic Champion and winner of the Downhilll World Cup. Estenson Racing was born out of Team Owner Tim Estenson’s passion for motorcycles and flat track racing. In just their first full year of racing, Estenson Racing quickly established themselves as one of the top non-factory teams in American Flat Track. They reaped success early with an AFT Singles Championship and an X Games Gold Medal and followed that up in 2018 with their first win in the Twins class and multiple wins on the Mile in AFT Singles. Next year the team is more than doubling in size with JD Beach, Jake Johnson and Kolby Carlile in AFT Twins, and Ryan Wells and Dallas Daniels in AFT Singles.